It is said that once upon a time (before 1992 when the Yugoslav army & Bosnian Serb forces destroyed most of the city) Sarajevo was "the" city in Eastern Europe. It had a gorgeous buildings, a diverse educated population (still does), and a growing economy. Nowadays, it's very rundown. Most of the buildings & monuments have been blown up and torn down. Many have been replaced with Soviet-style cement block buildings. Those left standing have significant bullet damage. The Olympic Stadium was in repair. The door-operator told me to try again next week (yeah, that's going to work). 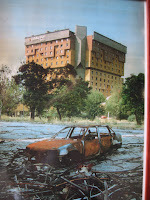 It could be fixed up, however the Bosnian war left Sarajevo poor. As such, it does not have money to spend on refurbishment. 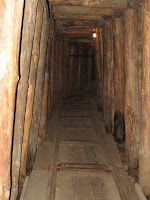 There are only 2 things standing which are worth seeing in their current condition: the old city and the tunnel museum. The Old Town, an area of 10 blocks, has many small shops, pretty cobblestone streets (murderous for those walking in stillettos), and gorgeous architecture representing a mixture of religious influences. 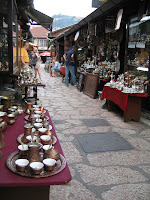 Workers in Sarajevo are especially known for their great craftsmanship in creating metal things. The tunnel museum consists of a movie of the war (shows buildings getting blown up), 1 wall of newspaper clippings, and a 25ft area of the famous tunnel, which brought supplies in & out of Sarajevo during the 4 year Bosnian war. The part that makes this museum impressive is that the original owner of the house/museum (under which the tunnel is located) is also the person who owned it during the war. His experiences and descriptions of the war and the tunnel are remarkable. He talked about the constant flooding in the tunnel, the gas and electricity lines there, how only 1 person from each family would be granted a permit to use the tunnel - this was to ensure that they would return to Sarajevo and their family, and not abandon the city. 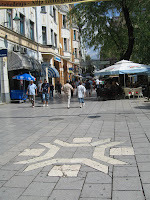 Many important historical events have happened in Sarajevo, however there is no evidence of them and no historical markers to explain the history. It would be smart to read-up on the history before traveling here. Pic1: Rose of Sarajevo - these are found on the sidewalk wherever a shell exploded. Pic4: A photograph from the Tunnel museum. It shows the Holiday Inn right after the bombing. That's cool that you went to these cities. I've been to Belgrade in Serbia. But no other Balkan cities. They're on my list though. Great to see you that you're posting blogs often! If you want to read an excellent novel that has ties to Sarajevo, read The Lazarus Project by Aleksander Hemon, who is Bosnian. It was a National Book Award Finalist last year.